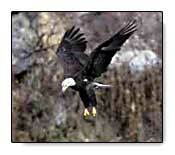 Designated as a Montana Wildlife Viewing Site, the lakes are an exceptional area. 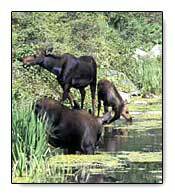 Some area residents include: moose, deer, antelope, black bear, otter, beaver, and bobcat. Both the serious and casual birder will be astounded by the quantity and quality of birding opportunities. Bald eagles and osprey nest on the lakes. Watch the branches of old growth firs for great gray owls or look to the skies, shorelines and lakes to see sandhill cranes, hawks and trumpeter swans. All seasons are good for viewing, but in winter Wade Lake stays partially ice-free, providing excellent habitat for wildlife and waterfowl. 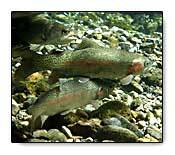 Winter guests are also privileged to view hundreds of spawning rainbow trout in the stream below the cabins. In summer enjoy fishing, hiking, birding, wildlife viewing, mountain biking, photography or the area’s other attractions and activities. In winter enjoy cross-country skiing, snowshoeing, wildlife viewing and photography. Wade Lake Cabins is operated under a special use permit with the Beaverhead-Deerlodge National Forest and is an equal opportunity provider.